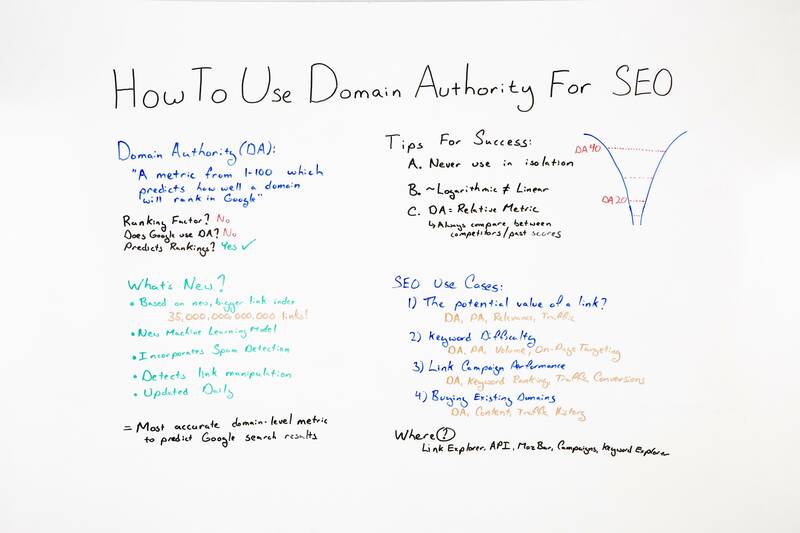 The Short Version: Don’t obsess over Domain Authority (DA) for its own sake. Domain Authority shines at comparing your overall authority (your aggregate link equity, for the most part) to other sites and determining where you can compete. Attract real links that drive traffic, and you’ll improve both your Domain Authority and your rankings. Unless you’ve been living under a rock, over a rock, or really anywhere rock-adjacent, you may know that Moz has recently invested a lot of time, research, and money in a new-and-improved Domain Authority. People who use Domain Authority (DA) naturally want to improve their score, and this is a question that I admit we’ve avoided at times, because like any metric, DA can be abused if taken out of context or viewed in isolation. Why do you want to increase DA? This may sound like a strange question coming from an employee of the company that created Domain Authority, but it’s the most important question I can ask you. What’s your end-goal? Domain Authority is designed to be an indicator of success (more on that in a moment), but it doesn’t drive success. DA is not used by Google and will have no direct impact on your rankings. Increasing your DA solely to increase your DA is pointless vanity. So, I don’t want a high DA? I understand your confusion. If I had to over-simplify Domain Authority, I would say that DA is an indicator of your aggregate link equity. Yes, all else being equal, a high DA is better than a low DA, and it’s ok to strive for a higher DA, but high DA itself should not be your end-goal. So, DA is useless, then? No, but like any metric, you can’t use it recklessly or out of context. Our Domain Authority resource page dives into more detail, but the short answer is that DA is very good at helping you understand your relative competitiveness. Smart SEO isn’t about throwing resources at vanity keywords, but about understanding where you realistically have a chance at competing. Knowing that your DA is 48 is useless in a vacuum. Knowing that your DA is 48 and the sites competing on a query you’re targeting have DAs from 30-45 can be extremely useful. Likewise, knowing that your would-be competitors have DAs of 80+ could save you a lot of wasted time and money. But Google says DA isn’t real! This topic is a blog post (or eleven) in and of itself, but I’m going to reduce it to a couple points. First, Google’s official statements tend to define terms very narrowly. What Google has said is that they don’t use a domain-level authority metric for rankings. Ok, let’s take that at face value. Do you believe that a new page on a low-authority domain (let’s say DA = 25) has an equal chance of ranking as a high-authority domain (DA = 75)? Of course not, because every domain benefits from its aggregate internal link equity, which is driven by the links to individual pages. Whether you measure that aggregate effect in a single metric or not, it still exists. Let me ask another question. How do you measure the competitiveness of a new page, that has no Page Authority (or PageRank or whatever metrics Google uses)? This question is a big part of why Domain Authority exists — to help you understand your ability to compete on terms you haven’t targeted and for content you haven’t even written yet. Seriously, give me some tips! Shocking, I know, but that’s the long and short of it. Links from high-authority sites and pages still carry significant ranking power, and they drive both Domain Authority and Page Authority. Even if you choose to ignore DA, you know high-authority links are a good thing to have. Getting them is the topic of thousands of posts and more than a couple of full-length novels (well, ok, books — but there’s probably a novel and feature film in the works). Our new DA score does a much better job of discounting bad links, as Google clearly tries to do. Note that “bad” doesn’t mean low-authority links. It’s perfectly natural to have some links from low-authority domains and pages, and in many cases it’s both relevant and useful to searchers. Moz’s Spam Score is pretty complex, but as humans we intuitively know when we’re chasing low-quality, low-relevance links. Stop doing that. Our new DA score also factors in whether links come from legitimate sites with real traffic, because that’s a strong signal of usefulness. Whether or not you use DA regularly, you know that attracting links that drive traffic is a good thing that indicates relevance to searches and drives bottom-line results. It’s also a good reason to stop chasing every link you can at all costs. What’s the point of a link that no one will see, that drives no traffic, and that is likely discounted by both our authority metrics and Google. Like any metric based on signals outside of our control, it’s theoretically possible to manipulate Domain Authority. The question is: why? If you’re using DA to sell DA 10 links for $ 1, DA 20 links for $ 2, and DA 30 links for $ 3, please, for the love of all that is holy, stop (and yes, I’ve seen that almost verbatim in multiple email pitches). If you’re buying those links, please spend that money on something more useful, like sandwiches. Do the work and build the kind of real authority that moves the needle both for Moz metrics and Google. It’s harder in the short-term, but the dividends will pay off for years. Use Domain Authority to understand where you can compete today, cost-effectively, and maximize your investments. Don’t let it become just another vanity metric. Following expertise, authoritativeness and trustworthiness guidelines should be a part of every SEO strategy no matter your niche. Stop optimizing for Domain Authority; it has no impact on Google rankings. One of the features that I’m most proud of in regards to Domain Authority is that it effectively addressed link manipulation in order of our intuition regarding quality. I created three different data sets out of one larger data set (auction domains), where I used certain qualifiers like price, TLD, and archive.org status to label each domain as high-quality, mid-quality, and low-quality. In theory, if the neural network does its job correctly, we should see the high-quality domains impacted the least and the low-quality domains impacted the most. This is the exact pattern which was rendered by the new model. High-quality auction domains dropped an average of 61% in Domain Authority. That seems really high for “high-quality” auction domains, but even a cursory glance at the backlink profiles of domains that are up for sale in the $ 10K+ range shows clear link manipulation. The domainer industry, especially the domainer-for-SEO industry, is rife with spam. Historically, we’ve relied on training Domain Authority against an unmanipulated, large set of search results. In fact, this has been the standard methodology across our industry. But we have found a way to improve upon it that fundamentally, from the ground up, makes Domain Authority more reliable. At the heart of Domain Authority is the industry’s leading link index, our new Moz Link Explorer. With over 35 trillion links, our exceptional data turns the brilliant statistical work by Neil Martinsen-Burrell, Chas Williams, and so many more amazing Mozzers into a true industry standard. In Chapter 6 of the new Beginner’s Guide to SEO, we’ll be covering the dos and don’ts of link building and ways your site can build its authority. If you missed them, we’ve got the drafts of our outline, Chapter One, Chapter Two, Chapter Three, Chapter Four, and Chapter Five for your reading pleasure. Be sure to let us know what you think of Chapter 6 in the comments! You’ve created content that people are searching for, that answers their questions, and that search engines can understand, but those qualities alone don’t mean it’ll rank. To outrank the rest of the sites with those qualities, you have to establish authority. That can be accomplished by earning links from authoritative websites, building your brand, and nurturing an audience who will help amplify your content. Google has confirmed that links and quality content (which we covered back in Chapter 4) are two of the three most important ranking factors for SEO. Trustworthy sites tend to link to other trustworthy sites, and spammy sites tend to link to other spammy sites. But what is a link, exactly? How do you go about earning them from other websites? Let’s start with the basics. Inbound links, also known as backlinks or external links, are HTML hyperlinks that point from one website to another. They’re the currency of the Internet, as they act a lot like real-life reputation. If you went on vacation and asked three people (all completely unrelated to one another) what the best coffee shop in town was, and they all said, “Cuppa Joe on Main Street,” you would feel confident that Cuppa Joe is indeed the best coffee place in town. Links do that for search engines. Internal links, or links that connect internal pages of the same domain, work very similarly for your website. A high amount of internal links pointing to a particular page on your site will provide a signal to Google that the page is important, so long as it’s done naturally and not in a spammy way. The engines themselves have refined the way they view links, now using algorithms to evaluate sites and pages based on the links they find. But what’s in those algorithms? How do the engines evaluate all those links? It all starts with the concept of E-A-T.
Google’s Search Quality Rater Guidelines put a great deal of importance on the concept of E-A-T — an acronym for expert, authoritative, and trustworthy. Sites that don’t display these characteristics tend to be seen as lower-quality in the eyes of the engines, while those that do are subsequently rewarded. E-A-T is becoming more and more important as search evolves and increases the importance of solving for user intent. Creating a site that’s considered expert, authoritative, and trustworthy should be your guiding light as you practice SEO. Not only will it simply result in a better site, but it’s future-proof. After all, providing great value to searchers is what Google itself is trying to do. To earn trust and authority with search engines, you’ll need links from websites that display the qualities of E-A-T. These don’t have to be Wikipedia-level sites, but they should provide searchers with credible, trustworthy content. Tip: Moz has proprietary metrics to help you determine how authoritative a site is: Domain Authority, Page Authority, and Spam Score. In general, you’ll want links from sites with a higher Domain Authority than your sites. Remember how links act as votes? The rel=nofollow attribute (pronounced as two words, “no follow”) allows you to link to a resource while removing your “vote” for search engine purposes. Just like it sounds, “nofollow” tells search engines not to follow the link. Some engines still follow them simply to discover new pages, but these links don’t pass link equity (the “votes of popularity” we talked about above), so they can be useful in situations where a page is either linking to an untrustworthy source or was paid for or created by the owner of the destination page (making it an unnatural link). If follow links pass all the link equity, shouldn’t that mean you want only follow links? It’s natural for your site to have a balance between nofollowed and followed backlinks in its link profile (more on link profiles below). A nofollow link might not pass authority, but it could send valuable traffic to your site and even lead to future followed links. Tip: Use the MozBar extension for Google Chrome to highlight links on any page to find out whether they’re nofollow or follow without ever having to view the source code! Visit Moz Link Explorer and type in your site’s URL. You’ll be able to see how many and which websites are linking back to you. When people began to learn about the power of links, they began manipulating them for their benefit. They’d find ways to gain artificial links just to increase their search engine rankings. While these dangerous tactics can sometimes work, they are against Google’s terms of service and can get a website deindexed (removal of web pages or entire domains from search results). You should always try to maintain a healthy link profile. A healthy link profile is one that indicates to search engines that you’re earning your links and authority fairly. Just like you shouldn’t lie, cheat, or steal, you should strive to ensure your link profile is honest and earned via your hard work. Tip: Earned mentions are often unlinked! When websites are referring to your brand or a specific piece of content you’ve published, they will often mention it without linking to it. To find these earned mentions, use Moz’s Fresh Web Explorer. You can then reach out to those publishers to see if they’ll update those mentions with links. Links from websites within a topic-specific community are generally better than links from websites that aren’t relevant to your site. If your website sells dog houses, a link from the Society of Dog Breeders matters much more than one from the Roller Skating Association. Additionally, links from topically irrelevant sources can send confusing signals to search engines regarding what your page is about. Tip: Linking domains don’t have to match the topic of your page exactly, but they should be related. Avoid pursuing backlinks from sources that are completely off-topic; there are far better uses of your time. Anchor text helps tell Google what the topic of your page is about. If dozens of links point to a page with a variation of a word or phrase, the page has a higher likelihood of ranking well for those types of phrases. However, proceed with caution! Too many backlinks with the same anchor text could indicate to the search engines that you’re trying to manipulate your site’s ranking in search results. That’s strange, and you’d be quite suspicious of your friends. The same goes for Google. Describing the content of the target page with the anchor text helps them understand what the page is about, but the same description over and over from multiple sources starts to look suspicious. Aim for relevance; avoid spam. Tip: Use the “Anchor Text” report in Moz’s Link Explorer to see what anchor text other websites are using to link to your content. Link building should never be solely about search engine rankings. Esteemed SEO and link building thought leader Eric Ward used to say that you should build your links as though Google might disappear tomorrow. In essence, you should focus on acquiring links that will bring qualified traffic to your website — another reason why it’s important to acquire links from relevant websites whose audience would find value in your site, as well. Tip: Use the “Referral Traffic” report in Google Analytics to evaluate websites that are currently sending you traffic. How can you continue to build relationships with similar types of websites? Spammy link profiles are just that: full of links built in unnatural, sneaky, or otherwise low-quality ways. Practices like buying links or engaging in a link exchange might seem like the easy way out, but doing so is dangerous and could put all of your hard work at risk. Google penalizes sites with spammy link profiles, so don’t give in to temptation. A guiding principle for your link building efforts is to never try to manipulate a site’s ranking in search results. But isn’t that the entire goal of SEO? To increase a site’s ranking in search results? And herein lies the confusion. Google wants you to earn links, not build them, but the line between the two is often blurry. To avoid penalties for unnatural links (known as “link spam”), Google has made clear what should be avoided. If you’ve ever received a “you link to me and I’ll link you you” email from someone you have no affiliation with, you’ve been targeted for a link exchange. Google’s quality guidelines caution against “excessive” link exchange and similar partner programs conducted exclusively for the sake of cross-linking, so there is some indication that this type of exchange on a smaller scale might not trigger any link spam alarms. It’s the exchange of links at mass scale with unaffiliated sites that can warrant penalties. These used to be a popular source of manipulation. A large number of pay-for-placement web directories exist to serve this market and pass themselves off as legitimate, with varying degrees of success. These types of sites tend to look very similar, with large lists of websites and their descriptions (typically, the site’s critical keyword is used as the anchor text to link back to the submittor’s site). There are many more manipulative link building tactics that search engines have identified. In most cases, they have found algorithmic methods for reducing their impact. As new spam systems emerge, engineers will continue to fight them with targeted algorithms, human reviews, and the collection of spam reports from webmasters and SEOs. By and large, it isn’t worth finding ways around them. Link building comes in many shapes and sizes, but one thing is always true: link campaigns should always match your unique goals. With that said, there are some popular methods that tend to work well for most campaigns. This is not an exhaustive list, so visit Moz’s blog posts on link building for more detail on this topic. This content and link building strategy is so popular and valuable that it’s one of the few recommended personally by the engineers at Google. Blogs have the unique ability to contribute fresh material on a consistent basis, generate conversations across the web, and earn listings and links from other blogs. Creating a resource like this is a great way to attract a lot of links with one page. You could also create a highly-specific resource — without as broad of an appeal — that targeted a handful of websites. You might see a higher rate of success, but that approach isn’t as scalable. Resource pages are a great way to build links. However, to find them you’ll want to know some Advanced Google operators to make discovering them a bit easier. For example, if you were doing link building for a company that made pots and pans, you could search for: cooking intitle:”resources” and see which pages might be good link targets. You likely already know which of your site’s content earns the most traffic, converts the most customers, or retains visitors for the longest amount of time. You can also dust off, update, and simply republish older content on the same platform. If you discover that a few trusted industry websites all linked to a popular resource that’s gone stale, update it and let those industry websites know — you may just earn a good link. You can also do this with images. Reach out to websites that are using your images and not citing/linking back to you and ask if they’d mind including a link. The most common mistake new SEOs make when trying to build links is not taking the time to craft a custom, personal, and valuable initial outreach email. You know as well as anyone how annoying spammy emails can be, so make sure yours doesn’t make people roll their eyes. Provide value. Let them know about a broken link on their website or a page that isn’t working on mobile. Ask one simple question (typically not for a link; you’ll likely want to build a rapport first). Earning links can be very resource-intensive, so you’ll likely want to measure your success to prove the value of those efforts. Metrics for link building should match up with the site’s overall KPIs. These might be sales, email subscriptions, page views, etc. You should also evaluate Domain and/or Page Authority scores, the ranking of desired keywords, and the amount of traffic to your content — but we’ll talk more about measuring the success of your SEO campaigns in Chapter 7. A lot of the methods you’d use to build links will also indirectly build your brand. In fact, you can view link building as a great way to increase awareness of your brand, the topics on which you’re an authority, and the products or services you offer. That last point is what we’re going to focus on here. Reviews of your brand, its products, or its services can make or break a business. Don’t review your own business or the businesses of your competitors. Don’t have your staff do so either. Don’t set up a review station/kiosk in your place of business; many reviews stemming from the same IP can be viewed as spam. Read the guidelines of each review platform where you’re hoping to earn reviews. Be aware that review spam is a problem that’s taken on global proportions, and that violation of governmental truth-in-advertising guidelines has led to legal prosecution and heavy fines. It’s just too dangerous to be worth it. Playing by the rules and offering exceptional customer experiences is the winning combination for building both trust and authority over time. In the next and final section, you’ll learn how to measure the success of all your efforts, as well as tactics for iterating and improving upon them. Onward! Raw root linking domain counts performed substantially better than shares at ~20.5%. As I indicated before, this type of analysis is incredibly subtle because it only detects when a factor is both leading and Moz Link Explorer discovered the relevant factor before Google. Nevertheless, this result was statistically significant with a P value <0.0001 and a 95% confidence interval that RLDs will predict future ranking changes around 1.5% greater than random. The post Authority Pro for WordPress: Demonstrate Your Expertise and Build Trust appeared first on Copyblogger.